The Martin MAC 300 is an automated moving head washlight luminaire with an elegant contemporary design, a compact version of the successful MAC 600. This flexible atmosphere generator produces a wide variety of colors and effects and it is used wherever dynamic color wash is important – both indoor and out. The Martin MAC 300 fits discreetly in a ceiling or truss yet it is powerful enough to cut through even high ambient light levels. The Martin MAC 300 has proven to be well suited to a wide range of lighting applications. A CMY color mixing system provides nearly unlimited color choices. A separate 6 slot plus open color wheel offers additional color possibilities. All slots are replaceable and split colors are possible. CTC and UV filters are also included. A full range dimmer and fast 14 Hz shutter for strobe effect are standard. Preprogrammed macro sequences, for example a dimmer or strobe pulse, can be called up for automatic and quick programming. Zoom effect possibilities are provided by a variable frost filter. Smooth continuous transition from a standard wash to zoom effect creates the same zoom possibilities as conventional 1 and 2K-watt lights. The compact shell of the Martin MAC 300 is easy to detach. Modular construction makes components easily accessible and a snap to remove. Furthermore dedicated anchoring points, a safety wire attachment point, a quarter-turn fastening system and a mid-pan-range locater make for trouble free rigging. Two separate Omega adapters and two different clamp types are available. A 4 digit LED readout allows the user to customize settings for easy programming. Error messages are easily understood, lamp and fixture usage is displayed and the readout flips for easy reading in any position. 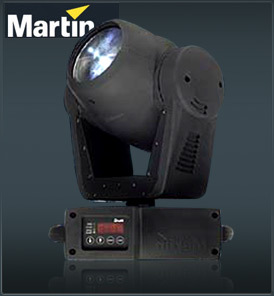 The Martin MAC 300 employs a 250-watt discharge lamp producing a luminous flux of 4800 lumens.